Employees at The Nesting House, a new children consignment shop on East Passyunk Avenue in South Philadelphia, shared a photo of a pile of parking tickets collected in the first few days of business. It didn’t take long for employees of a new East Passyunk Avenue children's shop to be welcomed to the neighborhood by the Philadelphia Parking Authority. 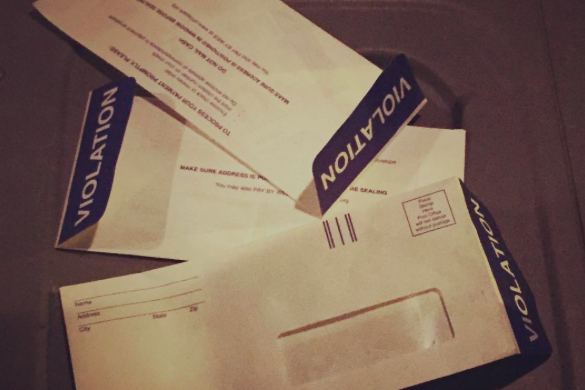 Employees at The Nesting House shared an Instagram post last month, a few days after the South Philadelphia store opened, showing a pile of parking tickets they had accumulated during the first few hours of business. "The trick is finding the streets here and there that aren't permit [parking,] even though you may have to walk a while, it's worth not getting a ticket or having to worry about it," one commenter posted on the photo. But that trick soon might become trickier as more than 50 city blocks are in the process of petitioning for residential permit parking. The PPA website notes residents can petition for permit parking by contacting the Philadelphia Parking Authority and requesting a petition package. To successfully add permit parking, the petition requires signatures from at least 60 percent of the residents of the block, including renters and owners of apartment complexes. There is no timeline for submitting the completed petition. The purpose of permits is to reserve spots for the people who live there, but that is a point of contention among residents, with some claiming the permits add even more angst to Philadelphia's parking drama. Based on the reaction to a recent Facebook post by a Philadelphia resident that's racked up more than 260 reactions and 150 shares, residential permit parking might not be an answer to your parking woes. Others chimed in that the PAA can, and often does, ticket for expired inspections and other additional violations when scanning for permit violations. Once a block turns to permit parking, residents can purchase permits for vehicles registered and insured to nearby addresses upon providing proof of residency . The annual permit fee is $35 for the first car, $50 for the second, $75 for the third. The fee to secure permits for four of more vehicle per household is $100 each per year. Residential parking permits are valid for the entire permit parking district where the permit is issued. The PPA's map of those parking districts can be found here. So in theory, a person who lives several blocks away can snag a spot in front of your home if they have a permit in your district. Vehicles without a permit, which includes any friends or family who come to visit or nearby shop customers, can park on permit blocks for up to two hours – or risk the wrath of the PPA.